War-date Autograph Document Signed “T. Seymour” 1pp. 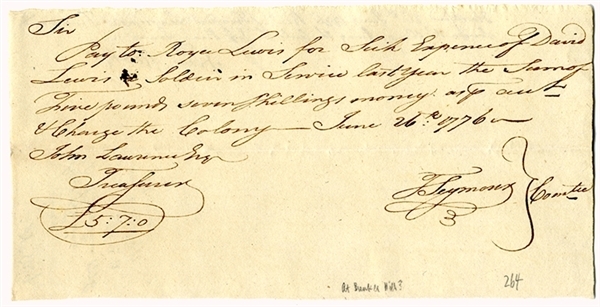 oblong octavo, June 26, 1776, requesting pay for “Roger Lewis...of David Lewis Soldier in Service last year... ” from John Laurence. Very good condition. Thomas Seymour (1734-1829) was the first Mayor of Hartford (1774-1812) when he signed this document.